today's sepia saturday photo doesn't feature anyone from my family, instead it is of some of the boys my mother went to high school with. surprisingly unlike most of the photos in my treasure trove of old photos, this one has the names of all of the people in the photograph. on the back, in blue ink is my mother's distinctive script with the name of each fellow. unfortunately, the photo itself is in fairly deplorable condition; I scanned it and present it as is. 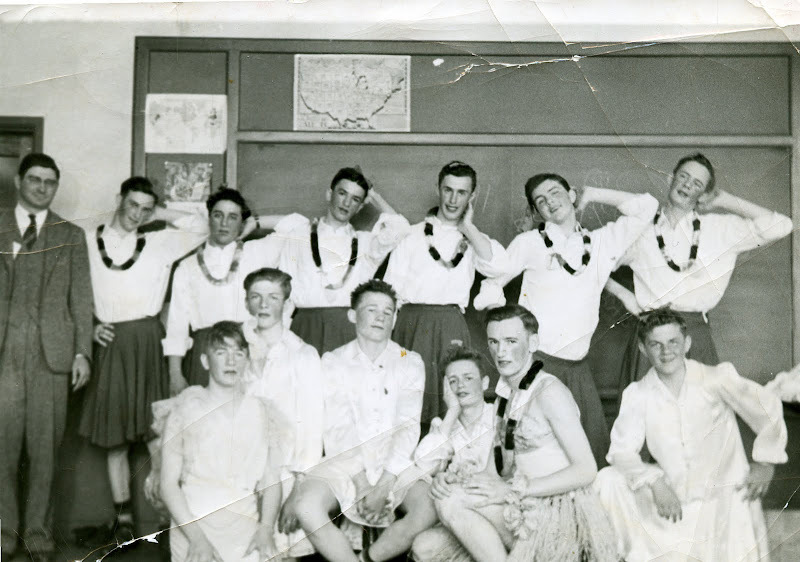 the photo was taken during "junior day" in 1942 and according to my mother's notation on the back the group called itself ferdenand's follies after the teacher mr. ferdenand who is quite distinguishable as the only man not in drag. I just called my mother to see if she could provide the back story to the photo. she was very surprised to learn that I have the photo. she apparently hasn't seen it since she she was a bachelorette living at home with her parents - let's see that would be about 60 years ago! I told her that the reason I have the photo is because it was one of the many photos and documents that I rescued from being incinerated by her mother. I remember visiting nana sometime in the early 1990s and happened to have caught her during one of her purging binges. I don't even want to think of all the photos and documents that I didn't rescue from going to the burn barrel! my mother only had a vague recollection of mr. ferdenand's follies and simply remarked that it was part of some school program. she did say she remember that her high school boyfriend was one of the boys in the photo, and mentioned his name and the sports he played in high school. however, discretion is the better part of valor and you won't find this mouse spilling the beans on who rita dated before she met and married my father, god bless his soul! as everyone knows in 1942 the united states was engaged in wwII - the country was still at war when these young men graduated from high school in 1943. on the back of the photo, added at some future date, in my mother's hand in fine red ink, printed above each young man's name, is a branch of the military. each boy but one had a branch of the military listed in my mother's hand. research mouse that I am found this man's obituary and learned that he served in the naval reserve during wwII - giving 100% participation by these twelve individuals. somebody else is taking my place sung by peggy lee with the benny goodman orchestra. according to the portal this was a hit song in 1942.
glad you were able to rescue this fine photo and others from your grandmother's cleaning binge. Wonder how many of them survived the war? meri, was wondering that myself. i know at least 2! i didn't devote too much time this morning hunting down the names, but did find 2 obits of the 12; both lived relatively long lives. It certainly is a fantastic photo, I too wondered how many survived the war. So dreadful to go from such a carefree time to then go off to war. It would be fun if a few of them googled their own name and came across your post...and contacted you! What a neat photo...they look like they are having a great time. what a nice photo story. I had to rescue many things from my father who, like your nana, would go on cleaning binges & rid the house of "junk". I think people get into that the closer they get to death. Dad was a real pack rat and never threw much out. Mother did that for him. After she died, my brother or I would throw out old mail and newspapers and the like. He never would burn photos. He sent them to my brother or I. Hence, I have many large manila envelopes filled with photos for every decade. sigh. Photographs such as this are such important documents which always seem to contain more raw history in every pixel than a host of history books. Great photo, and a great description. I think someone from England would say, "How cheeky!" but this is a great photo op! Very cool thanks for sharing it! Oh a rescued photo with such information...yes that was a different time, but patriots all. I am always trying to purge but tend to hold onto things like photos, ahh what if...interesting that you found an obituary too. They are really hamming it up in that photo. I wonder if any of their descendants (hoping they all survived the war) will find your blog when searching for parents or grandparents. Wouldn't they be surprised?! How good that you were able to save some papers from the burn barrel.